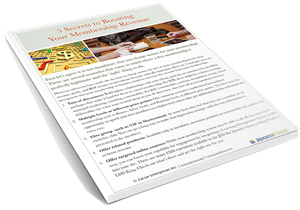 Click here to learn 6 Ways to Boost Membership Revenue! 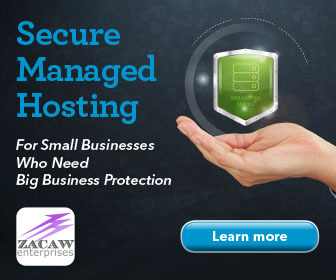 Empower your members. Save time. Get JoomFuse with JF Portal. Build your membership site with our power trio! 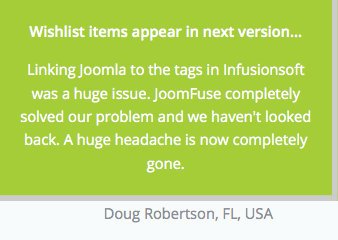 JoomFuse integrates your Joomla membership site with Infusionsoft (Keap), creating a seamless, flexible platform for your members, customers, and/or employees to access content as you wish. Login to download the newest version. JF Portal builds on JoomFuse to save time and give you control over what your members can see, cancel, or update on their account. Decreases support calls and tickets! 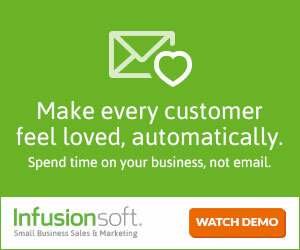 We are proud to be a Partner with the leading sales and marketing software for small businesses that helps them get organized, grow sales & save time. FREE - 6 Ways to Boost Membership Revenue! 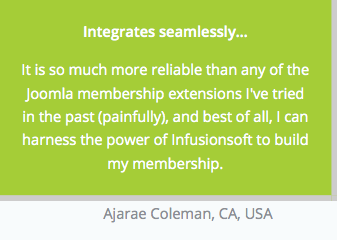 A solid membership integration solution for Joomla website owners with Keap (Infusionsoft)! JF Portal combines with JoomFuse to give you a hands-off way to seamlessly manage your members between your Joomla website and your Keap (Infusionsoft) application. JoomFuse manages access to the protected member content on your website through direct integration between Joomla and Keap (Infusionsoft). Add on JF Portal and you can give your members access to control their account. With configuration options that you control, members can update or change credit cards and update their billing information.